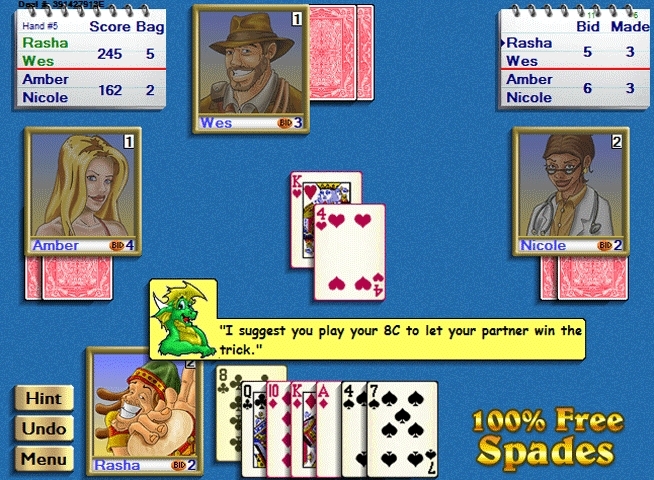 100% Free Spades is the latest version of the all-time favourite card game. This version has been declared as the most famous partnership card game in the United States. 100% Free Spades has been developed by Dreamquest Software. You can play this game against the computer and real players via a local network. In the beginning, the game very simple and had few features. The developer has introduced a lot of new features. These new features have increased the excitement of the players. The Pocket PC Magazines Best Card Game Award is the evidence of its popularity. Let us have a look at the new features of this game. Most of the time, we encounter issues like adds and other spyware. These issues arise when we download free games. 100% Free Spades has no such issues. Its download is safe and brings no spyware. This game also does not cost you anything and free to play. This game will work as a tutor if you do not know how to play spades. You will find a short tutorial the first time you run this game. You will also get a guide to learn the rules of this game. This game will provide you tutorials with the change of the game level. In the early days of this game, it was a slow game that moves on at same pace. This thing has been changed now to enhance the excitement. The developer has introduced five skills level in the new version of this game. Beginners can enjoy hint, undo, replay and other practice features. Expert players will experience the advance strategies used by their opponents. These strategies keep on changing with a change in skills level. 100% Free Spades has introduced 24 new exciting characters. This game is no more the same old style game with similar players every time. These playful characters will attract you and hold your interest in the game. The best thing about 100% Free Spades is that it supports all Windows versions. It works well with Windows 7/ 8/ 8.1 and 10. The need for PC specifications are least. This makes it possible for every PC owner to enjoy this game. Major update with Vista and Windows 7 and 64-bit support new characters smoother game play AI improvements and much more!